Hering Sanikonzept GmbH will in future be building a total of nine public toilets at Hesse's motorway service stations. The curving façades and unusual shapes in particular will be really eye-catching here. 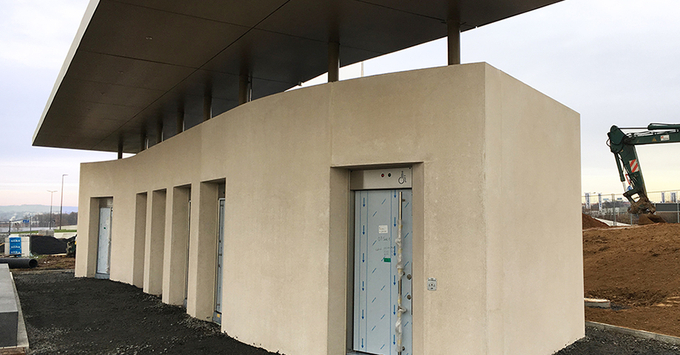 The first WC is currently being installed on the truck parking lot at the Kassel Ost filling station and services on the A7 motorway. 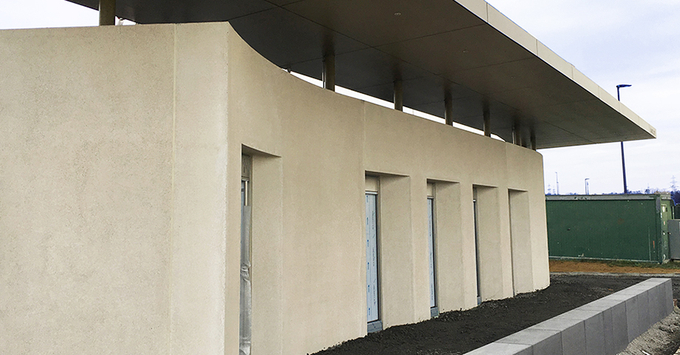 Curved shapes and modern LED lighting concepts: the nine toilets on the car park above all feature an architecturally unusual, curved concrete façade manufactured entirely by Hering. They also boast sophisticated LED lighting systems. Modern LED panels backlight the entire glass wall panelling in the urinal and unisex cubicles and create eye-catching lighting accents inside the building. The facilities may be divided into three basic types overall (Types A, B and C). They all come with unisex cabins (from two to four cabins each), a urinal cabin and a WC for the disabled. The facilities’ shapes vary, however: Type A is an elongated curved building with four unisex module cubicles. Type B is an ellipsis-shaped structure equipped with four unisex cubicles. The third type is similar to Type A but offers only two unisex cubicles and is therefore slightly smaller.